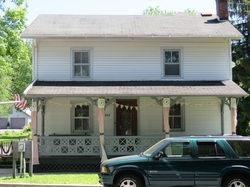 Built 1910. Original use: built by John and Al Gingrich as a building to store ice which they harvested from a pond east of the intersection of Boal Avenue and Boalsburg Pike off Spring Creek, on the McFarland/Aikens Estate. The ice, if stored properly with enough sawdust, would keep the family supplied with ice all summer long. This practice continued until the 1930s when electrical refrigeration was widely available. Items of note: The residence on this property is a log home built in the early 1800s by Isaac Womer, a saddler. He subsequently sold the property to Christian Gingrich. Womer moved into a newly built vertical plank building known as the Jessop House (address??? Historic number 41) so he could be closer to his harness shop. Christian was a farmer when he purchased the house. He built a blacksmith shop on the property which years later( in 1910) John and Al Gingrich incorporated into the current barn. They also built the wood shop, located between the barn and ice house. John Gingrich was an operator at the Linden Mill and brother Al was a blacksmith. The hinges and locks on the Ice House were handmade by Al Gingrich. John, subsequently died in 1917 at the age of forty during the flu pandemic and is buried in the Boalsburg Cemetery. An ice house such as this would have provided the Gingrich families with ice for their icebox, to make ice cream, and for their summer drinks. In addition, large quantities of perishables such as milk and butter could have been kept in the ice house itself. Ice houses are an example of how common materials and ingenious design were incorporated to create a sustainable architectural design. The doors are hollow, eight inches thick, and have cut outs on the top and bottom which were used to fill the doors with sawdust. The metal standing seam roof was topped with a cupola which was necessary for proper ventilation. Air intake vents are located along the top of the poured concrete walls, along the running sides of the building, just under and between the roof joist. A “spring” house was attached and used the ice melt water. Sawdust was not only used to fill the doors and walls, but would be placed between the layers of ice blocks. This provided the insulation to enable the building to maintain the ice through the hot summer with no electrical refrigeration! Although all indications are the Gingrichs used the Ice House to supply their family’s needs, commercial ice houses were common throughout the US at this time. Many of the rail ways and lakes in Pennsylvania, especially the eastern half, were constructed to provide ice for the cities of NY and Philadelphia. Ice was a multi-million dollar industry until the advent of refrigeration. Ice houses, the unique tools of the trade, and the ice delivery man are all relics of a gone by era.